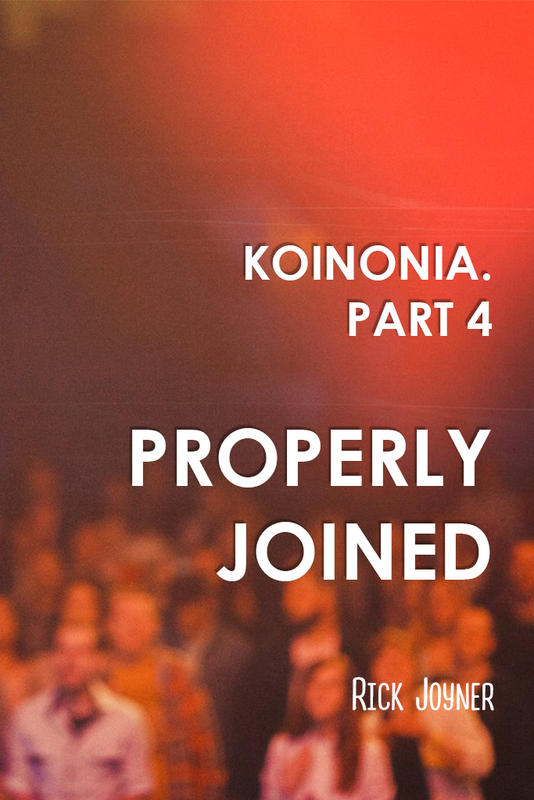 We have been covering how having koinonia is essential for the true New Covenant life for fulfilling The Great Commission to make disciples, not merely converts. In the New Testament, every new believer’s discipleship began with being “added to the church.” There simply is no other biblical way to walk with God that does not also include being connected to the body of Christ as a member of His church. We cannot be properly connected to the Head without also being properly connected to His body. Church life is required for discipleship in Christ. Books are now being written to try and justify not needing to be part of a local church. They say that one just needs to be a part of the “kingdom,” etc., but that is contrary to the testimony of the New Testament, regardless of how wise the rationale might seem. If we are disconnected from His body, we are also disconnected from the Head. He may still bless us as much as He can, and we can still learn about Him and be used by Him, but we will be drifting further from Him too. This may be the primary reason why many will come to Him on that day having done many works in His name, yet He tells them to depart from Him because He never “knew” them (see Matthew 7:23). The Greek word translated “knew” in that text is not implying that He did not know who they were, but that He did not know them in the context of an intimate relationship. The Scriptures are clear that we cannot really be joined to Him without also being joined to His body, the church. Granted, the church is far from what it is meant to be. Most people I have talked to about why they quit going to a local church say things like: they were not getting their needs met, were not being fed, got wounded or disappointed. No mature Christian or true disciple would ever base a decision on those kinds of things. A mature Christian or a maturing disciple lives to give not to get. If they are wounded or disappointed, they rejoice that they were given an opportunity to take up their cross and forgive others the way Jesus did, growing in love, patience, etc. If the local church we have been called to is far from what it should be, how do we know that it was not our presence and input to that church that would help them get to where they are called to be? If we abandon our post, our assignment in Christ, we are departing from His will. We may be abandoning many of His people when they need us most. This does not negate the fact that the Lord does, from time to time, call people to spend time alone with Him or send them on new assignments or to a different local church. However, I have never seen Him lead someone out of a situation in defeat. He “always leads us in His triumph” (see II Corinthians 2:14). We are not called to go from defeat to defeat, but from victory to victory, glory to glory. We should get a victory in one place before leaving it, so that we are leaving it in victory. We are told in Isaiah 58 that if we are walking in the light, the glory of the Lord will be our rear guard. This means that we will be leaving a trail of His glory behind us, not a trail of defeats. We should always leave something built, not torn down. What does the trail behind us look like?